It is difficult to choose between Santosh Sivan the film-maker and Santosh Sivan the cinematographer because he seems equally good in both roles. Though Halo, his first film as director, was a revelation, it was his next film Terrorist that brought him to the notice of the international film scene. After that, he has made several off-beat and commercial films and has wielded the camera for some very interesting projects. Santosh Sivan's latest directorial venture, Inam (Ceylon in the English version) is releasing on March 28. The subject is the war and bloodshed during the two-decade-long civil war in Sri Lanka. 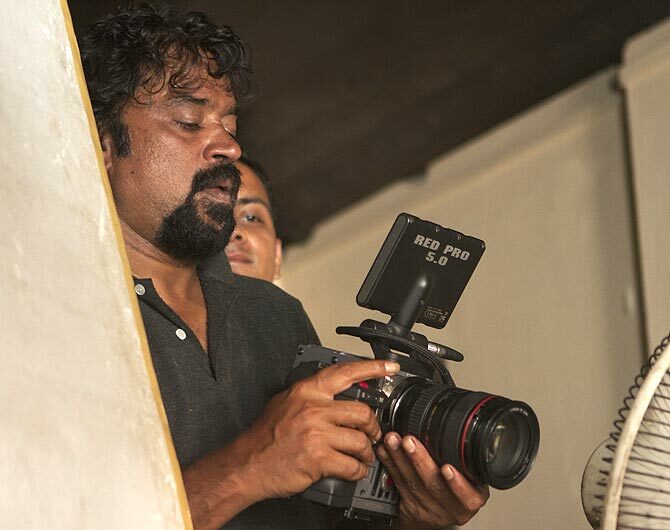 In this exclusive interview, Santosh Sivan speaks about the film. Terrorist was based on the armed struggle in Sri Lanka. Now, you are making another film in a similar setting. Were you very disturbed by what happened on the island? One common factor that runs through all the films that I have made so far is that land as a very important character. A farmer or someone like him, living on the land where his ancestors have toiled for centuries, has life. When people fight for a piece of land, it makes you look at it from a different perspective and you understand its significance. When I made Terrorist, I understood what was happening in Sri Lanka deeply. Many friends gave me books on the people so that I learnt more about them. That made me more and more interested in the subject. Inam means mob. It becomes a mob when people identify themselves with a cause whether it is language, religion or race. Mob has a unified colour. Here also, people belonging to a culture and cause unite for a cause. That is why I named the film Inam. One day, I had dinner with a friend from school in Mumbai. He was married to a lady from Sri Lanka. Along with her was another woman from Sri Lanka who didn't speak much, but said many things through her eyes. She was a refugee from Sri Lanka who runs an orphanage. Later, I came to know how she started the orphanage and the kids living there were all refugees of the war. I thought why not make a film with the premise as refugees. I feel that if you don’t tell the story, who will? After all, it was happening so close to us. I didn't want to make a documentary but a very human story about refugees. The life of a refugee is universal. Is your film about refugees of Sri Lanka? No, it is not about the refugees but about how people became refugees. The conflict in the island has made a lot of children orphans. So has the tsunami. There is this character called Tsunami Akka, played by Saritha who is a survivor of the tsunami. She feels God made her survive because He wanted her to do something. So, she starts an orphanage for the young orphans of the conflict. She wants all these children to be independent and grow up thinking they have a family. According to her, all the orphans in the orphanage are one family. All of them have a different story to tell but when they are together, what binds them is the feeling of one family. There is also this teacher played by Karunas who wants all the young boys to go abroad for higher studies to escape the war-torn country. But Tsunami Akka thinks they should not leave their homeland. Then, in 2009, the last war starts. A lot of them run away to fight the war and the big family splits up and each of them try to survive. Are they all real characters? Yes, a lot of them are taken from real life. The story is told from the perspective of a special child. Karan, the boy who plays the role, is also a special child; he has Down Syndrome. In the film, he only knows that he has to give a knife to his big brother who is fighting. So he is on a hunt to find his brother. That is how he also becomes one of the youngsters fighting to survive. Is the crux of the story about how all these people survive the war? Yes. Through the journey of all these people, we tell the story of the war. It is not a documentary; it is a film. We are not trying to hurt the sentiments of anyone; it is the depiction of life as it happens in a war. Is it not the same story wherever there is a war? Yes, this can happen in any place in the world where there is conflict. That is why I have made an English version titled Ceylon. I want the world to see the film. People should understand who really gets affected by war. I want the people of Sri Lanka also to see the film. I have not portrayed that all army people are bad. But, yes, there is enough evidence that points fingers at the army. One has to take the side of the people who suffer, and when you take the side of those who suffer, we have to blame the perpetrators of war and who hurt them. We only take the side of innocent people. I have made the film in the form of an emotional thriller. My idea was to make a film like During the Midst of War. How difficult is it to make a film that has to show many war sequences? That is a part of film-making. You have to make difficult films too; you can't be making easy films all the time. There are many war sequences in the film, as the film is set during the 2009 war. It is not the grandeur of a war film that you see in Inam but the emotions connected with the war. I was sure that I didn't want to use a lot of computer graphics to make the film look rich. I wanted people to feel that they were in the middle of a real war. I believe that one helicopter bombing an area full of people is more horrific than hundreds of helicopters showering bombs. Was this the toughest film to make, or was making films with children tougher? It was quite difficult making a war film. With kids, you just go with them and don't change too many things. Children are amazing actors as they don't care how they look or how they act. Here, I have a special child acting in the lead role. He always wanted to say 'action' 'cut'. When you make a film like this, it is important to have a bunch of people who will work with the film and for the film. They all have to be motivated. It was not a big budget film but a film made by a group of highly motivated people who believed in the film and the cause. When you have such a team, half the battle is won. How did you make a child with Down Syndrome act in the lead role? I am often asked by the media how it was to shoot Aishwarya Rai Bachchan and such celebrities. One day, a friend of mine asked me to take pictures of his daughter; he felt I would make her look beautiful. They brought the kid to Chennai for the shoot. The kid was just eight, and had Down Syndrome. Suddenly, I was at a loss how to shoot such a child. I spent a lot of time shooting, and while shooting, and later also, I started thinking about what she felt about things and how she lived. It was that incident that made me decide to look at this war from the point of view of a special child. And a special child will never take sides; he can't. He is equally nice to army personnel or civilian. Could he understand what exactly you were trying to portray? If you take pains to understand them, they also get closer to you and are comfortable with you. After the film shoot, he went to participate in the Special Olympics in Australia, and won a gold medal. When you make a normal actor act as a special person, they over-do everything. Here, this boy just behaved the way he does always; he has his own sensibilities and his own way of reacting. He also cares for a lot of things in his own way. Where have you shot the film? We have shot in five different locations - Rameswaram, Kerala, Chennai, Maharashtra, and a little bit of candid stuff in Sri Lanka also. You have named the film Ceylon in English. Why Ceylon and not Sri Lanka? From the time we were kids, we have referred to the country as Ceylon. Even today, many people call it Ceylon. I still cannot forget Radio Ceylon which I grew up listening to. Ceylon is the name the ancestors of the country had given it. Even today, I feel Madras and Bombay have their own flavour. That way, Ceylon is quite a nostalgic name.